On our first visit all those years ago, a few days before Christmas, Michael and I came down to San Miguel de Allende from Mexico City on the train, arriving at the dusty station to be met by a marauding posse of young boys and the owner of the apartment we were renting. “Joven!” she called out to them as she handed some coins through the car window. “Déjennos en paz!” After she settled us into the little apartment over Cello’s Pharmacy on Canal Street, we looked out as a full moon came up over the golden dome and crenelated walls of Bellas Artes. Rows of sparkly red and green garlands spanned the street all the way up and down Canal, and the sidewalks fluttered with people. We heard some faint sort of honky-tonky music, and as it got louder, we saw that it was a little parade––la posada as we later found out––with a couple of men playing trumpet and drums, leading a donkey and a pickup truck carrying a young girl and boy on hay bales, dressed as Mary and Joseph, and followed by a crowd of people carrying candles, flowers and paper lanterns. From that very first hour in town, we were hooked. 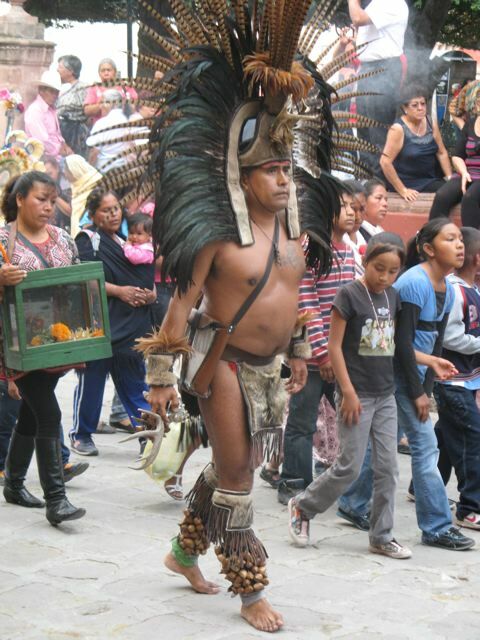 During the decades since, my husband and I have watched so many parades and festivals in San Miguel, from the flower-hatted Catrina skeletons who stalk the streets on Day of the Dead to Día de los Locos (Day of the Crazies) and the annual procession of little kids on United Nations Day. While we were having coffee one morning under the archways alongside el jardin, the central square, families began arriving, filling the park. Down the hill from the top of Canal marched the local police band, bugles blaring, ahead of hundreds of kindergarten-age children wearing elaborate costumes of the countries of the world. Solemnly, quietly following their teachers, they carried white paper doves and white balloons, and signs about world peace––we were in tears to see the innocence and the intent on those little faces. Throughout the year, weekend festivals are lively with Indian dancers, patriotic tableaus, religious ceremonies, horseback processions, music, and fireworks at all hours–no kidding, it’s a good thing that we’re no longer buying film for our cameras or we’d be in serious debt. As San Miguel is one of the birthplaces of Mexican independence, the El Grito de la Independencia commemoration in September is a very big deal here. The hero for whom the town was named, Captain Ignacio Allende, and Captain Juan Aldama and others, kick-started the 1810 revolt that ultimately booted out the conquistadors. September 16 is Mexican Independence Day, a national holiday celebrated throughout the country and over three days in San Miguel with pyrotechnics each night and through the early hours of the mornings, and by military parades, band concerts and thousands of locals and visitors dancing in the streets, waving flags and even wearing them. Fancy banners with images of the conspirators arch over the main streets surrounding the Ignacio Allende House museum, el jardin and the cathedral. We were in town once during Independencia with an expat friend, Ted, who is the great-great-great-great (I don’t know how many greats) grandson of Doña Josefa Ortiz de Dominguez, a heroine of the revolution. Her bright face appeared on some of the banners around town, in fact, right beneath us while we sat at the rooftop bar at Mama Mia’s while Ted recounted how his ancestor, although she was the mother of 14 children and the wife of the mayor of Queretaro, held clandestine meetings in her home and alerted the rebels that the Spanish had discovered their plans. She was arrested, tried and jailed in various convents until 1817, when she was released, and eventually continued her activism. 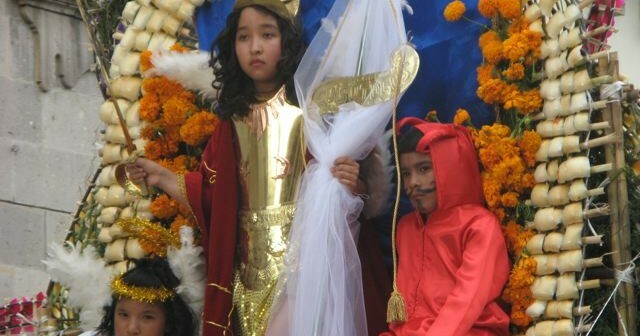 My all-time favorite events are the “Fiestas de San Miguel de Allende” in honor of the Arcangel Michael, who vanquished the devil when he dared to defy God. In advance of the saint’s feast day, September 29, dance troupes begin streaming into town from around the country, carrying costumes, sleeping mats and personal gear; the town feeds them and puts them up in the schoolhouses. At midnight before the feast day, on streets lined with spectators, they begin their slow alborada (dawn) procession, dancing and drumming all the way, heading up to el jardin and the iconic, soaring, pink- and coral-hued neo-Gothic cathedral, La Parroquia de San Miguel Arcangel. The dance troupes represent tribes of semi-nomadic Chichimecas who inhabited the area long before the Spanish conquest. Continuing a centuries- old tradition, they construct elaborate xuchiles–– huge wooden structures decorated with reeds and cucharilla cactus fiber, corn paste, marigolds and other flowers. 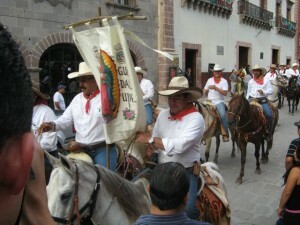 Between the dancers, the xuchiles are carried through the streets, then hoisted upright and fastened to the wall in front of the cathedral. 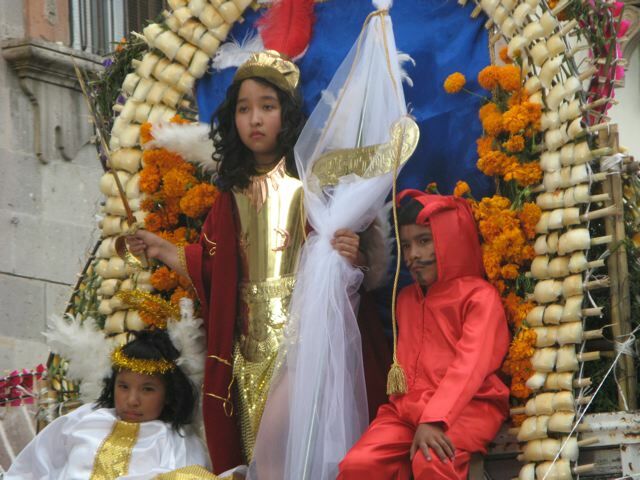 Outfitted in Spanish-style armor, helmets and swords, images of St. Michael are portrayed on truck-top floats by young girls, ironically, who are accompanied by gangs of sweet-faced angels in pastel clouds. In feathered headdresses and fearsome masks and body paint, hundreds of dancers perform for the crowd. Adding a carnival atmosphere, 10-foot-tall mojigangas––paper mâché puppets that are created here in town––totter along in the crowd. Townspeople carrying estrellas (stars), arrive at the cathedral, whereupon a mighty explosion of castillo fireworks and rockets is set off, and Saint Michael gets his Las Mañanitas (Happy Birthday) song. 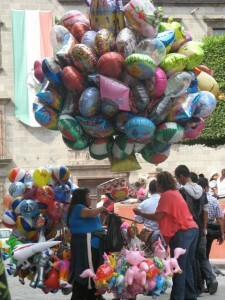 Families and tourists turn out for fiestas in San Miguel de Allende. As dawn rises, the dancers and the spectators wander off for a few hours, until they gather again in el jardin. A special mass is held for St. Michael, and the famous “Los Voladores of Papantla” fly in dizzying circles, head first, from the top of a 30-meter-tall pole. Firecrackers, bottle rockets and more whirling, smoking, popping fireworks blow off from time to time, and the amazing Indian dancers continue their rhythmic gyrations around and around el jardin, by this time in an emotional frenzy. The last night we were in town for all of this, our ears ringing from the ear-splitting fireworks, and tired and hungry after hours of sharing the sidewalks with the families who had streamed in from the countryside, we retired to one of our favorite eateries in a nearby alleyway. Through the tall, open windows we watched the mojigangas drift past, their garishly painted heads bobbing and flowing gowns aglow in the lights from the streetside cafes––the dancers, the drummers, the high-flyers and all the rest floating through the warm night as if in a dream. 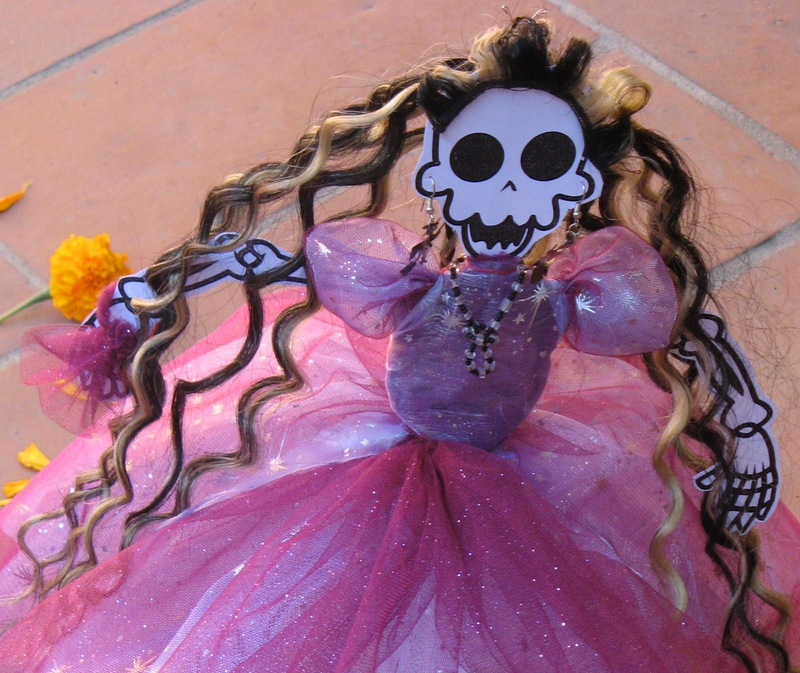 Day of the Dead—now that’s another story.